Calcium carbonate is one of the most common compound extracted from the crust of Earth and is used in in different industries, including paper, building and construction, cements, plastic, and sealants. On commercial front, calcium carbonate is available in two main types, to be specific ground calcium carbonate (GCC) and precipitated calcium carbonate (PCC). PCC is obtained because of reaction solutions of calcium hydroxide and carbon dioxide, while GCC is extracted by processing and crushing limestone into powder of calcium carbonate. The properties of GCC and PCC that incorporates particle size distribution, fineness, and color, helps in meeting the technical needs of the product for various applications. On the basis of detailed analysis in the report the growth of every one of those ventures, and a few others, will keep on surging the demand in the global calcium carbonate market at a considerable CAGR of 5.0% during the forecast period from 2017 to 2025. 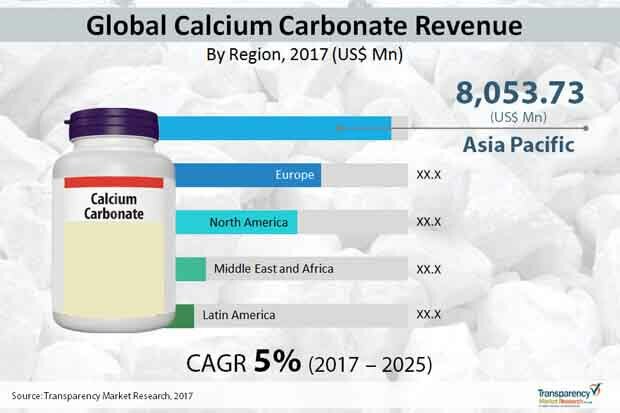 As per the research, the global calcium carbonate market is foreseen to reach around worth of US$22,311.06 mn before 2025, considerably more the end of 2025, from the market's assessed valuation of US$15,158.33 mn back in 2017. The surge in requirement for paints and coatings on the back of thriving construction and building industry, augmented demand in the paper business, developing utilization of nano-calcium carbonate in the pharmaceutical and rubber enterprises are boosting the growth in global calcium carbonate market. Moreover, government activities for the development of the plastics industry in the Middle East are among the major factors fueling the demand in the global calcium carbonate market. Then again, environmental concerns of mining limestone and negative impacts of utilizing calcium carbonate in dietary supplements are a couple of limitations testing the market for the same. Rise in demand for calcium carbonate from the paper sector has been on surge lately, witnessing a growth in paper production, and this is estimated to keep going in upcoming years too. While accelerated calcium carbonate (PCC) and calcium carbonate in powdered form are both utilized for the production of paper, the previous remains the favored material inferable from the flexibility in operation it holds. Calcium carbonate is utilized as an additive and extender to make paints and coatings more durable and bright. Also, it is utilized as building material and fixing in different products, for example, concrete, rooftop singles, renders, paving, ceramics, and so forth. Calcium carbonate reduces the shrinkage in sealants and adhesives and furthermore enhances their gap filling properties and consistency. In oil and gas sector, calcium carbonate is utilized as added substance in liquids that are connected in boring to control the infiltration volume of fluids from the stone while penetrating. It is utilized as a major compound in calcium source in animal feed and agricultural lime to advance development of animal. Dietary supplements additionally contain calcium carbonate as a product of calcium. It is additionally utilized in shaving creams, cosmetics, and haircare and skincare products. On the basis of geography, Asia Pacific leads the demand in the global calcium carbonate market, promising to earn a revenue of worth US$12,231.16 mn by the end of forecast period. The demand in the Asia Pacific calcium carbonate market is ready to increase at a better than expected CAGR of 5.4% during 2017 to 2025. Then again, Europe and North America re next two lucrative regions, and anticipated that would remain so in future as well.